Our website has been adapted and updated. The name remains: www.kasteeltuinhemmen.nl. You are very welcome to attend an open-air concert which will take place in the castel-garden at 8 p.m. on Saturday, June 22nd. One of the participating musicians is Hanna Rijken from Utrecht. In case of bad weather the concert will take place in the Dutch Reformed Church of Hemmen. In the morning of August 31st, we will have our annual, special programme for all the people who support us financially or otherwise. There will be a speaker on a horticultural topic, classical music is part of the programme and there will be stalls selling plants, art, local produce etc. Official invitations plus programme will be sent in August. 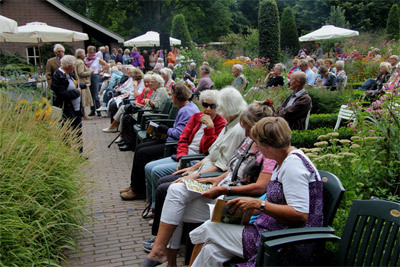 As we aren’t subsidized, gifts and donations to the ‘Stichting Kasteeltuin Hemmen’ are particularly welcome. The garden is open to visitors from May 1st till November 1st. Opening hours daily from 8 a.m. till 7 p.m.
You are very welcome and we hope that you will enjoy your visit.